Coffee connoisseurs will often agree, good cold brew coffee can provide a great cup of coffee. It’s possible to buy cold brews, and cold brew concentrates in stores and coffee shops, but you can also make cold brew coffee at home. Making this kind of coffee isn’t too tricky, but how do you find the best cold brew coffee maker? Below you’ll find our favorite cold brew coffee makers and a comprehensive guide to buying one for yourself. Regardless of if you’ve been making cold brew coffee for years or you’re new to the technique, you’ll find an appliance that’s right for your needs. ​This brewing system features medical grade stainless steel and a laser cut filter that is guaranteed not to rust. ​​This cold brew system from Klein provides an excellent solution. 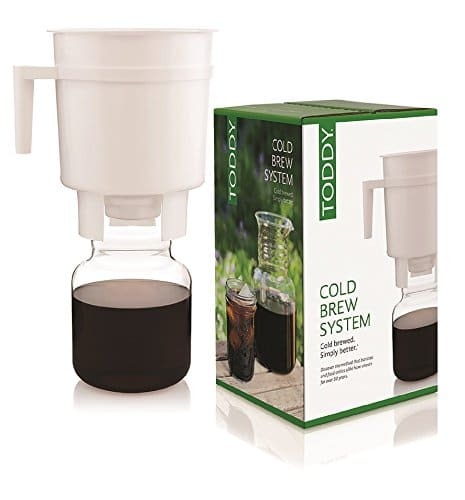 ​This pitcher style cold brew coffee maker will make up to 41 ounces of cold brew coffee at a time. It is important to us that we only recommend quality products that will offer excellent value for their cost. To ensure that the products we support are the best out there, we examine how they are made, what their price is, and how well they perform. You’ll find each of the products below rated with a specific number of stars. The best products on the list are located at the top of the list and have five-star ratings. Each of the products we have chosen has excellent customer reviews, are long-lasting, and will provide you with a great cold brew coffee. From the favorite brand KitchenAid comes this unique cold brew coffee maker. Made of stainless steel and glass parts this appliance is built to last. This maker has a small footprint and will fit comfortably on any countertop or in the refrigerator. 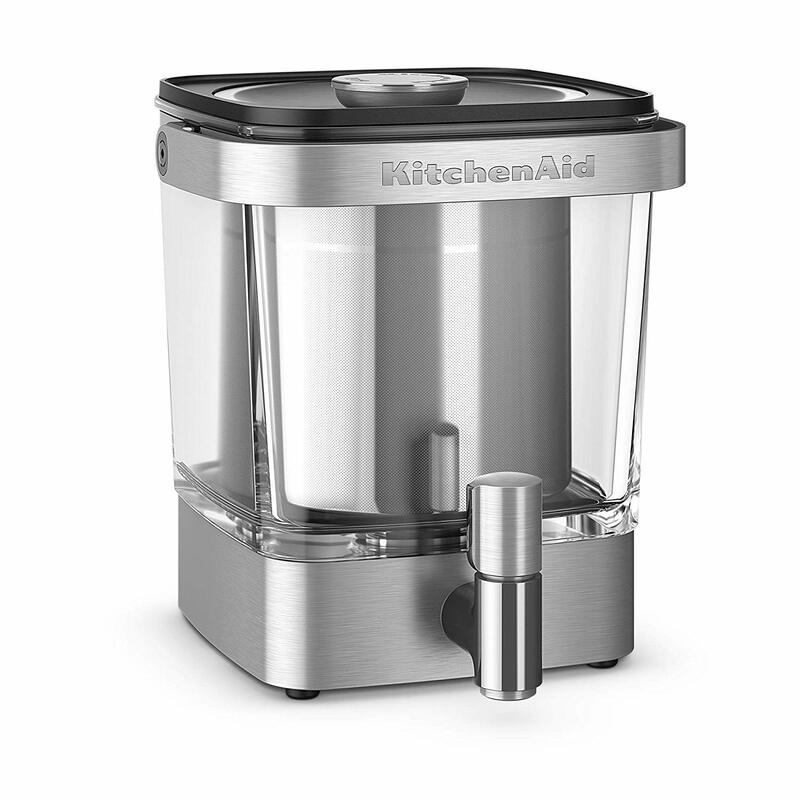 The KitchenAid KCM4212SX features a stainless steel tap so that you can dispense your cold brewed coffee directly from the countertop or fridge easily. Also, this model has a handle for increased portability. Also made of stainless steel is the reusable steeper that includes fill-level indicators. 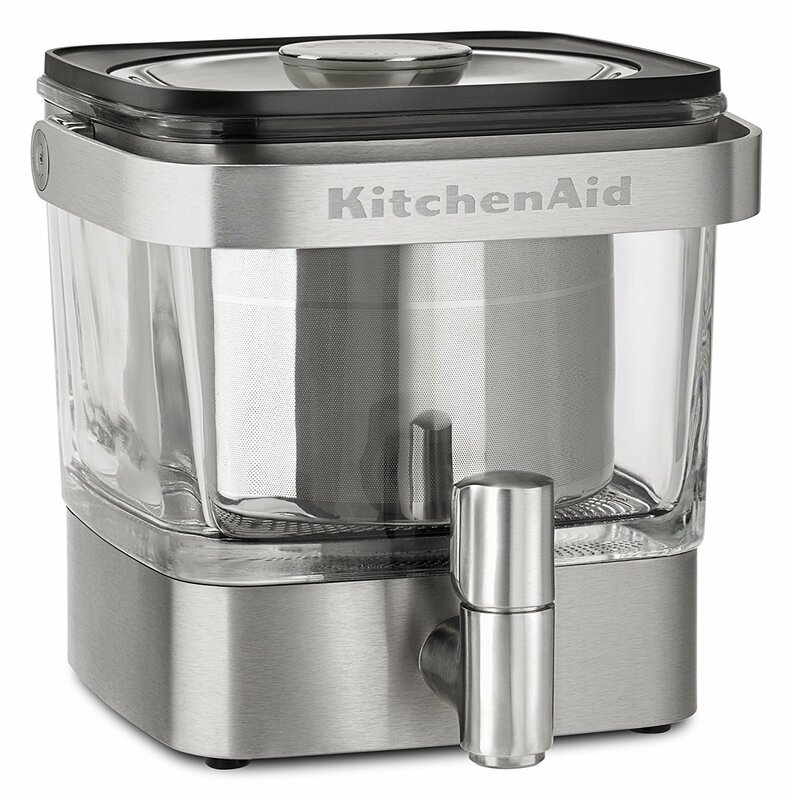 Customers love that this device comes with the peace of mind known to the KitchenAid brand. The high-quality parts, simple brewing process, and fantastic customer service give. One customer's only nit to pick is that the round metal lid doesn't lock or seal into place on the black plastic lip. If you have to move the coffeemaker in the middle of the brewing cycle (ie when it is full to the brim), be careful -- a bump or inadvertent tilt could lead to a big spill. The Ovalware RJ3 features a simple yet attractive design that will fit comfortably in any fridge. This brewing system features medical grade stainless steel and a laser cut filter that is guaranteed not to rust. 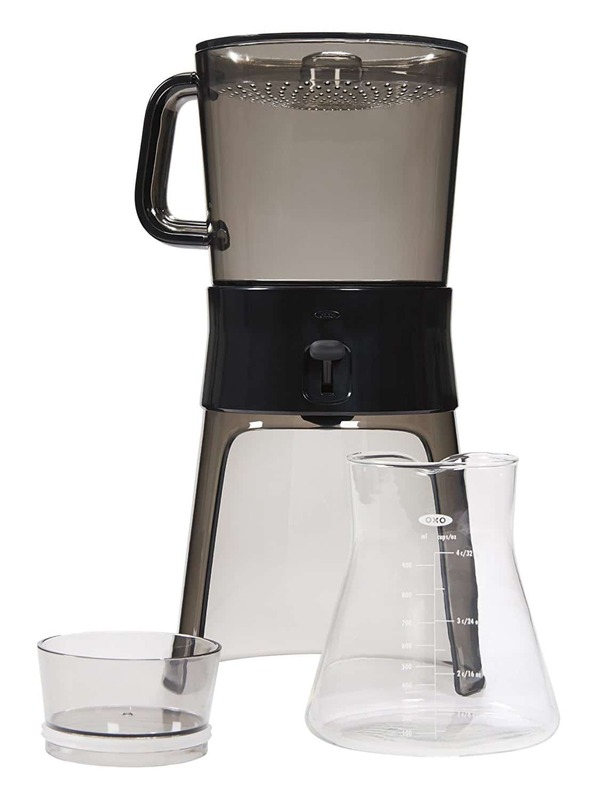 The cap on this carafe style brewer features a BPA-free silicone seal that will keep cold brew coffee fresh for up to two weeks. Also, this air-tight seal will prevent unwanted fridge odors from permeating your cold brew coffee. Several customers have noted that this device is rather small for heavy coffee drinkers and that it produces a weak brew. Due to these adverse remarks, we’ve given this cold brew maker 4.8 stars. Customers love the simplicity of this cold brew coffee maker and the fact that it is dishwasher safe. Ovalware provides a 90-day money back guarantee when you purchase this coffee maker and a free ebook for best brewing practices. The top may not stay tight with the filter in. So while the filter makes a tight seal to the beaker, the top basically just sits in the filter. There is no tension holding it in place and there is no seal. For coffee lovers that also love simplicity, this cold brew system from Klein provides an excellent solution. While this “kit” features only a filter, a gasket, and a coffee spoon, it fits into any size wide-mouth mason jar. 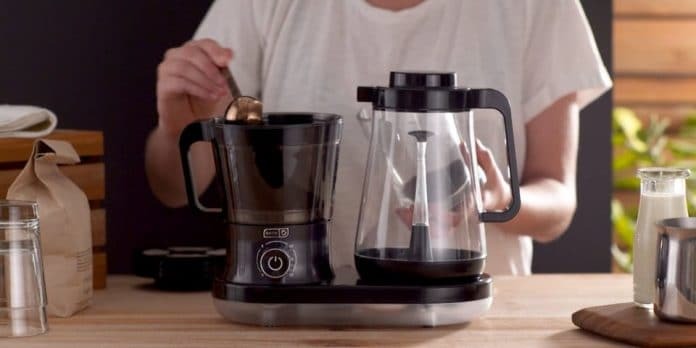 Because the user can choose what size jar to use, this device offers up more variety than some other brewing systems. The filter included with this kit is made of 304 stainless steel wire mesh. The included gasket is BPA-free. The small 100-micron mesh prevents any grounds from being dispersed through the cold brew. Also, this brewing system works well for other applications such as making nut milk or infused waters. 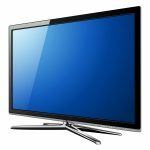 For its simplicity, durability, and ease of use, this system ranks with 4.9 stars. Customers love the sturdy design of this cold brew kit and how easy it is to clean. Additionally, many customers have found that it works well with jars both large and small. One customer review stated that the lid was difficult to close on mason jar when using the seal that comes with it. The Primula Pace Cold Brew Coffee Maker is easy to use and great for small spaces. This pitcher-styled brewer comes equipped with a mesh filter and can handle any coffee. While sporting a small footprint, this device holds 1.6 quarts of cold brew coffee. Because this model is easy to use and features a helpful customer service department, we’ve rated this maker with 4.5 out of 5 stars. However, we’ve taken a few points off for questionable durability and excessive dripping from the lid. Customers enjoy the small size of this maker and appreciate that it is dishwasher safe. Some customers have noted that the plastic lid does not hold up to the test of time. Also, it’s possible that the mesh filter included with this brewer may not hold up as long as the stainless steel filters featured in other cold brew makers. 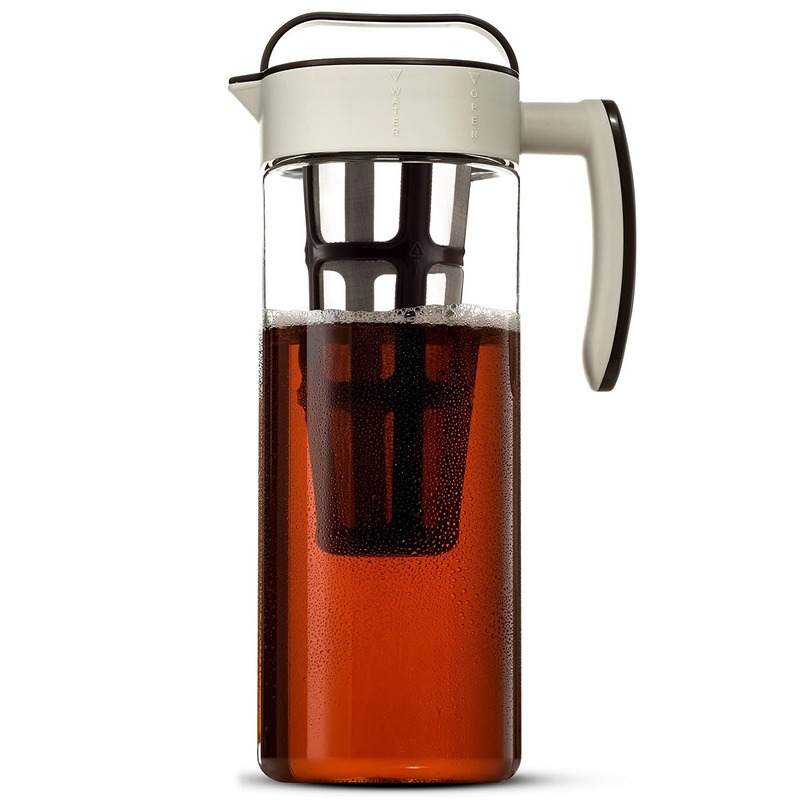 This affordable cold brew coffee maker from Bodum provides customers with a reliable system at an affordable price. 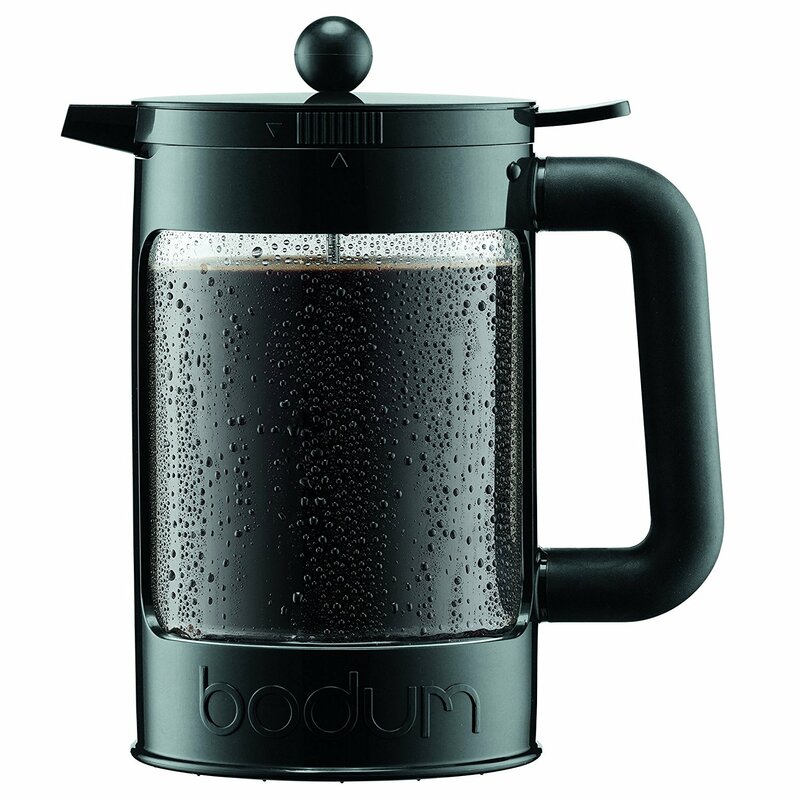 Bodum is well-known for its French Press coffee makers, and this device uses the same technique. However, unique to the cold brew set is an airtight lid specifically for overnight brewing. Because this system is easy to use and loved by most customers, we’re giving it 4.5 stars. Plastic construction is indeed not ideal, but it is BPA free and durable. Many love the low cost and ease of this product, others have noted a few problems. Some customers dislike the plastic construction of this brewer. Others have pointed out that coffee can get stuck between the carafe and the outer layer of colorful plastic. From the reliable Japanese brand Hario comes this petite cold brew coffee maker. Available in three different colors and two different sizes, this pitcher-style cold brewer is simple yet attractive. This carafe features high quality, heat-resistant glass that will stand the test of time. And while some of the parts are made of plastic, customers have reported that these pieces are reliable and durable. Overall, for its supremely low price, this cold brew coffee maker presents an excellent value. If budget is your primary concern, this device is a winner with 4.5 stars. This maker includes a reusable mesh filter and an easy-to-use pour spout. Some customers dislike the fact that this maker is not dishwasher safe, and others have had complaints about how tall the larger version is. Also, the lid is not airtight which can result in awful tasting coffee or spills in your fridge. 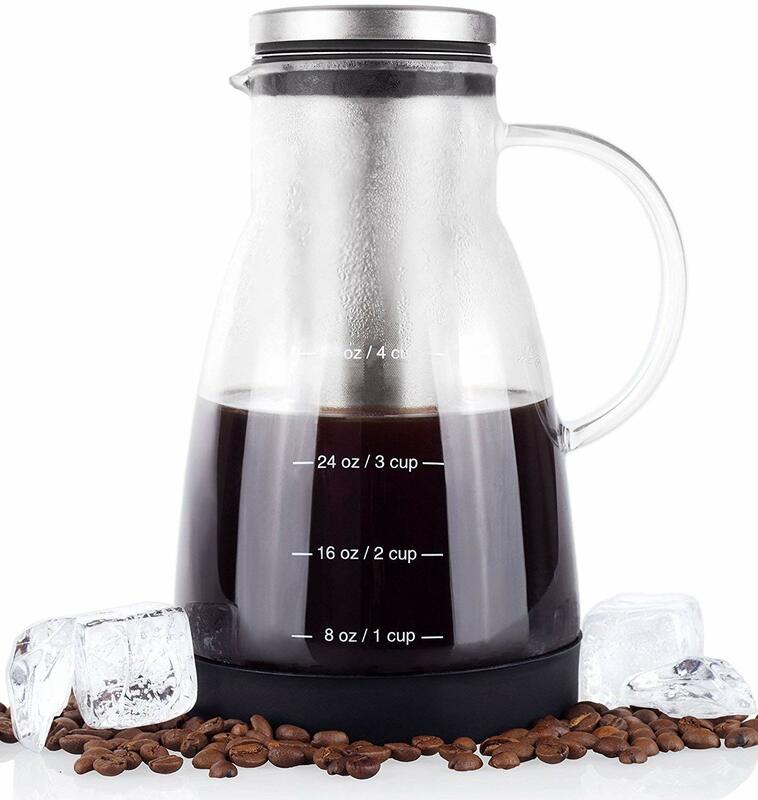 From the well-known kitchen goods brand, OXO comes a cold brew coffee maker that is simple to use and aesthetically pleasing. This maker will brew up to 32 ounces of cold brew concentrate at a time. 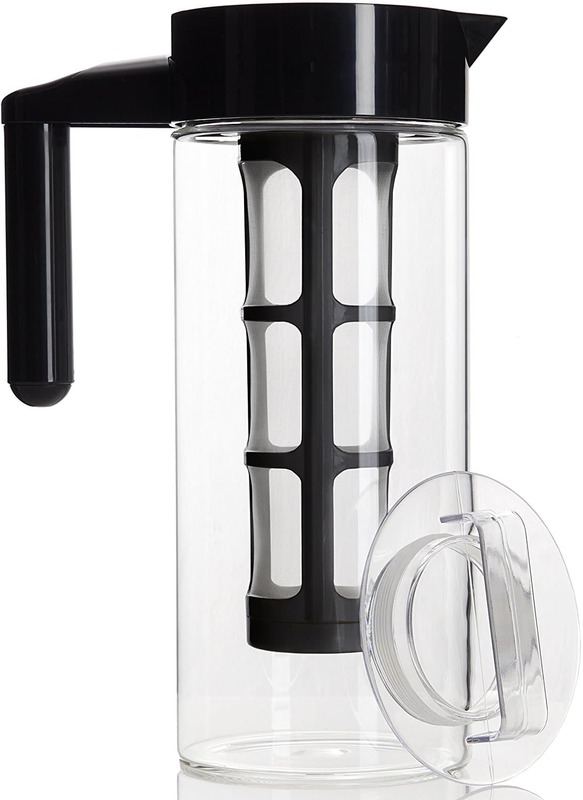 This model uses a fine mesh stainless steel filter that is reusable and includes a glass carafe for ease of use. Customers love how straightforward this device is. Also, many people have reported excellent experiences with the customer service department. Overall, customers agree that while this brewer provides excellent quality cold brew coffee, it does have a few issues. The primary concern that users have with this model is leaking. Additionally, some customers do not like the fact that the brewing device is constructed of plastic. We’ve given it 4.4 stars. It comes apart quickly for quick cleanups and simple storage. The lid can be improved. The decanter can also improve to hold the same volume with a smaller footprint. For many people, the Toddy Cold Brew System represents the gold standard in cold brew coffee. This simple system comes with two parts, the brewing device, and a glass decanter. To get the brewed coffee from the plastic brewing device into the glass decanter, you must remove a plug. Many customers report that this maker is reliable and produces a good cup of coffee consistently. However, some customers have noted that the process of removing the stopper to drain the brewed coffee into the decanter is complicated and messy. Ultimately this brewer is more challenging to use than other models on the market today. Additionally, the plastic construction of the brewing device is a turn-off for many consumers. Overall we give this brewer 4.3 stars. The Toddy comes with two reusable filters for added convenience and a recipe guide to get you started. A customer could have given it a 5 star if the handle was attached, the plastic was higher quality, and the stopper was made of a material that did not get so stained. It makes a great cold brew nevertheless. Designed and produced in South Korea, this Komax cold brew coffee maker is durable, convenient to use, and elegant in appearance. 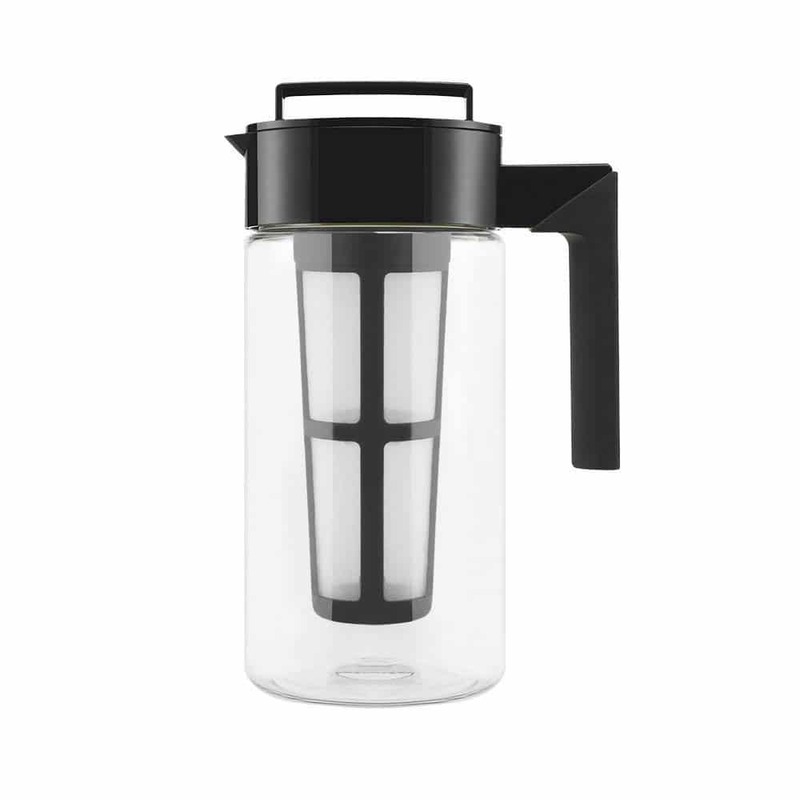 Featuring a square design to save space in your refrigerator, this pitcher-style brewer is made of Tritan plastic. As a final note, customers enjoy the silicone accent on the handle of this device. 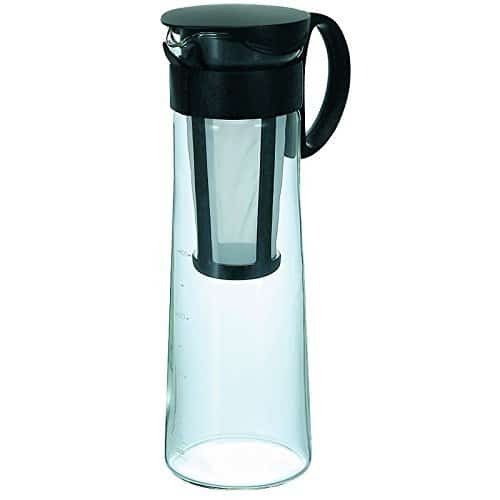 While the plastic structure of this pitcher is quite durable, users enjoy this non-slip functionality. Because the plastic used in this design is BPA free and the maker features a unique square design, we’ve rated it 4.2 stars. Customers enjoy the space-saving square design of this cold brew maker. Also, it offers consumers a reasonably large capacity. Some customers have reported that the mesh filter is weak and breaks quickly. 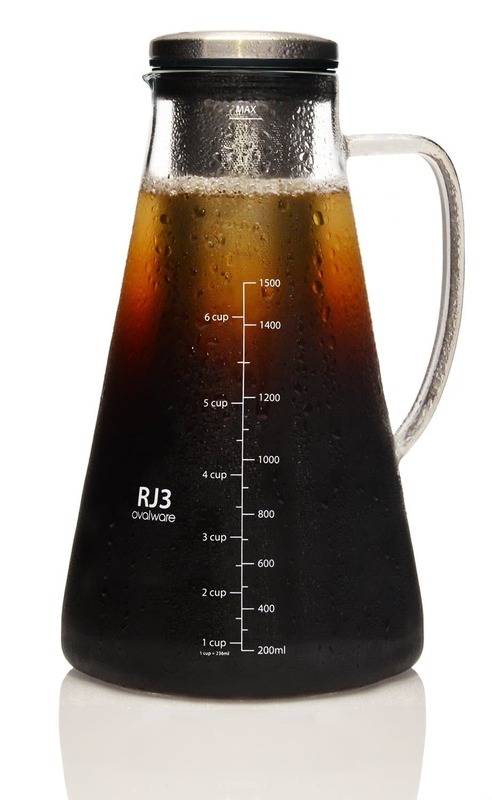 This pitcher style cold brew coffee maker will make up to 41 ounces of cold brew coffee at a time. Unlike some other cold brew makers, this device is intended to brew ready-to-drink cold brew as opposed to cold brew concentrate. However, many customers have reported a consistently weak brew when using this cold brew maker. Also, a few customers have found that the glass carafe is incredibly thin when compared to other brewing devices. Because the customer service for this product is exceptional and the design is attractive, we’ve given this brewer four stars. Customers love the elegant design of this maker and the superb customer service provided with it. Additionally, the removable nylon mesh filter makes cleaning and maintaining this device easy and convenient. Some minor setbacks that a customer had was the rubber flange on the mesh strainer core doesn't actually seal the coffee/water from the outside. The pour spout is also definitely open to the air. Also the metal lid that closes the strainer core fits perfectly....to the strainer core. When shopping for the best cold brew coffee maker, there are a few points to keep in mind. 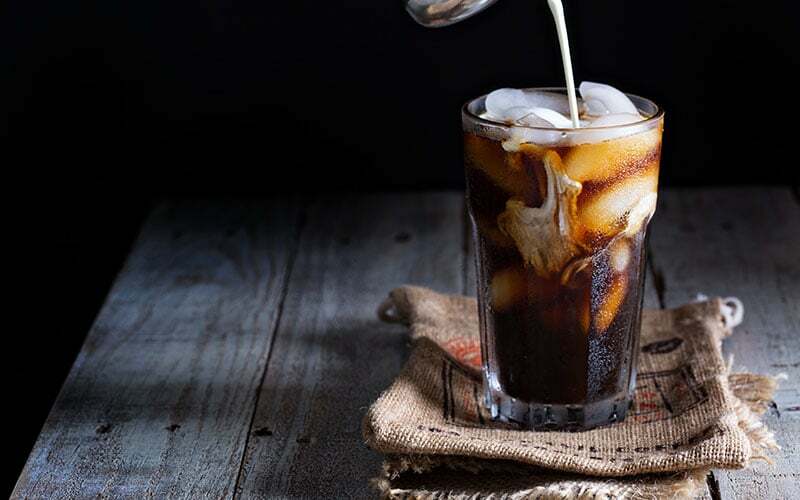 Below we’ll go over a few tips and tricks to help you decide what type of cold brew system will work best for you and your family. The first consideration you should make when looking for a new coffee maker is the size of the brewer. Not only should you consider what volume of coffee it will brew, but also how much space it will take in your refrigerator. Your choice of brewer may change depending on how much space you have available or how much coffee you’d like to brew. Another consideration to make when shopping for a new kitchen appliance is the price. 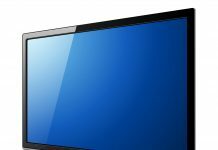 Some features, such as glass construction, cost more than others. Once you have decided what size coffee maker you want, you will find several options available at a wide variety of price points. To avoid leaving this device in your cupboard indefinitely, we recommend buying a cold brew coffee maker that is easy to clean and maintain. Some brewers have intricate designs that make them a pain to clean. Avoiding such complications will help ensure that you enjoy using your cold brew coffee maker. Concentrate or Ready to Use? Most cold brew coffee makers are designed to brew a coffee concentrate instead of a ready to drink beverage. Be sure that you know which type of beverage your brewer will make. Coffee concentrates are much higher in caffeine but taste smooth due to the cold brew method. It is surprisingly easy to ingest too much caffeine if you accidentally drink coffee concentrate. Overall, finding the best cold brew coffee maker can be a fun and easy process. 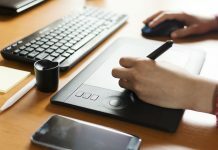 To make sure that you are getting the best bang for your buck, look for a device that is simple, affordable, and easy to maintain.